A test of sincerity to the government’s anti-endo campaign was launched today through caravan by an alliance of labor and church groups promoting dignity of labor and decent work. Several members of labor coalition Nagkaisa also joined the caravan. Yelling ‘sampol!’ in a picket held in front of the Department of Labor and Employment (DOLE) building in Intramuros Manila, CLC members demanded, as a test of guts, immediate action on pending cases related to contractualization effected by the country’s richest and biggest endo lords. A particular case was the 2011 massive outsourcing program that resulted in the loss of 2,400 regular jobs at the Philippine Airlines (PAL). The two-year dispute ended with a Settlement Agreement in 2014 between PAL and PALEA. 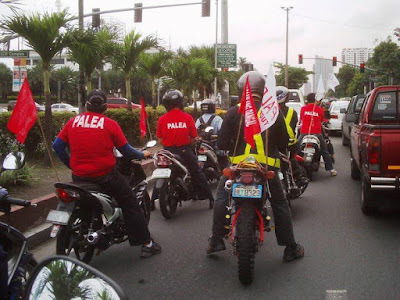 Under the Agreement, PAL will re-hire as regular workers PALEA members who were locked out by the company in October 1, 2011. Said provision of the Agreement has yet to be implemented by PAL. “Sec. Bello: Kailan ba ang hustisya namin sa endo lord na ito?” read a poster with a smiling picture of Lucio Tan held by a PALEA member. Lucio Tan presided over the mass layoff of PAL employees in 1998 and the outsourcing program in 2011. Aside from PAL, CLC and Nagkaisa members have also raised the issue of contractualization in companies owned by the richest businessmen such as Henry Sy, Gokongwei and the Araneta family who’s Pizza Hut was recently involved in mass termination of its sub-contracted employees. After the kick-off protest at DOLE, the CLC-Nagkaisa caravan proceeded to the PAL Office at Macapagal Avenue where they held a program until lunch time. Their next destination was the Senate where a hearing was supposed to be held the following day but which was moved to a later date. In the Senate, Partido Manggagawa (PM) and CLC co-chair Renato Magtubo urged the senators to pass the security of tenure (SOT) bills despite their non- inclusion in Malacanang’s priority legislative agenda. “As independent policymakers you can move beyond the Palace’s pre-occupation to crime by enacting more coherent anti-poverty and social justice measures such as the SOT and pay hikes,” said Magtubo. He also warned lawmakers not to fall into the trap of the proposed “win-win” solution proclaimed by the Department of Trade and Industry (DTI) which promotes, rather than prohibits, contractualization through a more devious scheme of outsourcing. From the Senate, the protesters drove towards the airport area to hold their final program, first at PAL’s In-Flight Center in Terminal 2 and at Gokongwei’s Cebu Pacific in Terminal 4. A candle-lighting at Nichols concluded the anti-endo caravan.